Ms. Vera Gogokhia is a leading civic activist who in 2012 founded You for Democracy, a Tbilisi-based NGO that focuses on developing a student activist network in Georgia. An allergy specialist by training, she worked at the Research Institute of Clinical Medicine in Tbilisi until June 2018, in addition to pursuing her democracy initiatives. 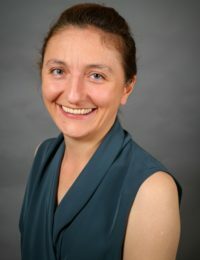 In 2007, she co-founded the American-Georgian Institute for Liberal Education (AGILE), alongside Ghia Nodia and Charles Fairbanks, to encourage classroom study of major works of political theory in higher education. This led to the launching of a NED-funded project to promote free discussion about democratic values through youth networks nationwide. A dynamic presence, Ms. Gogokhia is one of Georgia’s most insightful and creative democracy advocates. During her fellowship, she is examining the current rift between youth movements and political parties in Georgia, analyzing data from both sides to understand why young people reject traditional parties. Her goal is to explore avenues that would serve to bridge the gap and encourage youth engagement in Georgian politics.